Performance Metal Roofing | Steel Shingles | ME and NH | DECRAPerformance Roofing, Inc.
It’s easy to see the value in buying Steel Shingles. While the upfront cost of Steel Shingles may be more than that of an asphalt roof, the overall lifetime cost is significantly less. Consider this: while an asphalt roof may be less expensive, it will need to be repaired or replaced 10 to 15 years later. 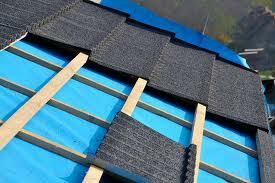 Steel Shingles, however, can easily last up to 50 years or more. Steel Shingles in ME and NH have other benefits, too, including reduced energy costs, reduced insurance prices, less likelihood of structural damage due to harsh New England weather and increased resale value of your home through home appreciation. Steel Shingles offers that classic look that features a traditional distinctive style, reinforced with the strength and longevity of steel. Available in a variety of natural earth tone colors, these colors incorporate a subtle natural shadow, which enhances the richness and detail of the roof. Most Steel Shingles are pressure formed aluminum-zinc alloy coated steel with an acrylic bonded stone chip finish. The stone coating resists fading and UV penetration. Why Maine and New Hampshire Should Hire Us for Steel Shingles and Repairs?